Tempeh is a popular food item in Indonesia traditionally made with soy as a staple source of protein. It’s believed to have originated in the Indonesian island of Java many centuries ago and is still enjoyed by the entire population to date. Unlike most fermented food that’s made with bacteria, tempeh uses a mould culture called Rhizopus. It produces a white outer layer as the mould’s mycelia spreads and grows in and around each soybean. As a result, this network of mycelia is what holds the product together into a patty-like consistency. In Indonesia, tempeh is traditionally fermented in ambient temperatures (30-31°C for 24-48 hours) while wrapped in banana leaves. Fresh tempeh will have a yeasty, mushroom-like aroma and a mild, nutty flavour. Just like fruits and veggies, fresh tempeh is always best. Because it is a live product, fresh tempeh will continue develop stronger flavours as it matures. Get ready for your stomach and body to thank you. Our tempeh is made with organic, non-GMO soybeans, and is created fresh for the boldest taste and texture right here in Vancouver. Each serving is packed with protein and fiber, plus it’s also a source of iron and calcium. If that wasn’t enough, our tempeh is unpasteurized meaning it’s literally alive and full of flavour! Organic soybeans, water, starter culture. CONTAINS: Soy. MAY CONTAIN: Dairy, mustard, peanuts, and tree nuts. It's also low in FODMAPs if served plain (may also depend on accompanying ingredients). Read more about the health benefits of temepeh in our FAQ section. The product must be kept refrigerated (1 to 4°C) and is best enjoyed within 5-7 days. During this time, there may be changes in the product’s appearance: the white mould may turn yellowish or have black spots. Because it is a live product, the culture will continue to mature. Black spots appear when the Rhizopus mold creates spores; do not be alarmed, they are safe for consumption! If you are not cooking your tempeh right away, you can also freeze it for 3 months with minimal changes to texture. We strongly advise against eating raw tempeh. Please cook the product thoroughly and do not eat it raw. Tempeh is an excellent flavour sponge thanks to its porous nature. Unlike tofu, it’s not water-logged so it has a firmer, “meatier” texture. The fermentation process also brings out a lot of savoury and nutty elements that you miss out on in tofu. We highly recommend brining and marinating it for a couple minutes --- it doesn’t take long for tempeh to absorb all that flavour! In general, tempeh loves dry heat so you can’t go wrong with frying, grilling, or baking. You can also add it to your favourite curry, salad, stir-fry, or wrap … Tempea can do it all! Scroll down below for our collection of recipes and check our social channels for stories from our test kitchen (we never outgrew playing with our food). Meet our original tempeh's earthier, more hearty cousin. Made with organic, locally sourced Eat Grain lentils and chickpeas, this tempeh is bound to make your tastebuds go wild. it's packed with two types of plant based protein and boasts a slightly earthier flavour, making it the perfect addition to your next salad, sandwich, or stir fry. Kabuli chickpeas, laird lentils, water, starter culture. MAY CONTAIN: Soy, dairy, mustard, peanuts, and tree nuts. Cook, chop, marinate and serve as you would our original tempeh! The pate spread your crackers never knew they were missing. Call all of your friends, gather around, pop open a bottle of wine, and get your best (plant-based) cheeses ready, because it's time to have a tempeh pate party! This pate spread is unlike any other—it has nothing but clean, pronounceable ingredients, it's packed with protein, and it's full of flavour. Don't worry, we won't tell if you don't want to share! The product must be kept refrigerated (1 to 4°C) and is best enjoyed within two weeks after opening. Serve on crackers, pita, rice cakes, or sandwiches! Yes, believe us, we get this all the time... Read all about it here! Why is there white and black stuff on my tempeh? Is this normal? They are both mould that are edible and safe to eat! The black spots are the spores formed by the Rhizopus culture that we use, so it is fine to eat after cooking. We sell the product during the peak of its fermentation, after which the mould starts to die off after a few days. During this period, stronger flavours and aromas will also start to develop. There are holes in my bag! Is this normal? We use perforated bags to allow for air circulation during the fermentation process: this lets the mould to grow around and expand in between the soybeans. Because it is a live product, the culture (quite literally) needs air to breathe. This determines how well the finished tempeh binds itself together. How can I tell if my tempeh is still good to eat? Our tempeh is always fresh and never pasteurized nor frozen. The signs to look for in fresh tempeh is that white, fuzzy exterior: this means that the mold is alive and the product is continuing to ferment but is at its "healthiest" condition. Because we are using live cultures, the mold will start to die or kill itself with time. Good tempeh should be firm and have a yeasty or mushroom-like aroma. If you're not sure whether your tempeh has gone bad or not, e-mail us with photos! Why is fresh tempeh the best tempeh? If you've looked for tempeh before, chances are the ones you've found are all frozen and pasteurized. Fresh tempeh will have superior taste and texture (and we're not just saying that!) because it hasn't been heat-treated. The white exterior is a visible sign that our tempeh is as fresh as it can be. Drop by our booth on one of our market days and you can taste the difference for yourself. What are the health benefits of eating tempeh? Would you believe that our tempeh has 1.4x more protein than extra firm tofu? All the carbohydrates present in our tempeh is also dietary fibre. It also doesn't contain any sodium, cholesterol or trans fats (unless you add them as you're cooking). It's also an amazing source of plant-based omega-3 and omega-6 fatty acids! As a fermented food, it’s easily digested by the body while bringing out unique flavours. We can go on forever. But isn't consuming soy bad for you? There's a lot of debate going on about soy foods and numerous studies are still ongoing. It really depends on a lot of factors: how much soy you consume, what's your current health condition, where the soy comes from and how it's processed. If there's anything conclusive about all these studies, it's that fermented, whole soy foods are the best type to eat. The fact that we only make our temepeh with certified organic, non-GMO soy is a bonus. For further reading, check out these articles from Time magazine, a vegan doctor (lots of science jargon though! ), and Thrive Cuisine. Ultimately, we respect everyone's opinions and we strongly encourage you to listen to your body first and to live a balanced and healthy lifestyle. Is your product vegan? Vegetarian? Organic? 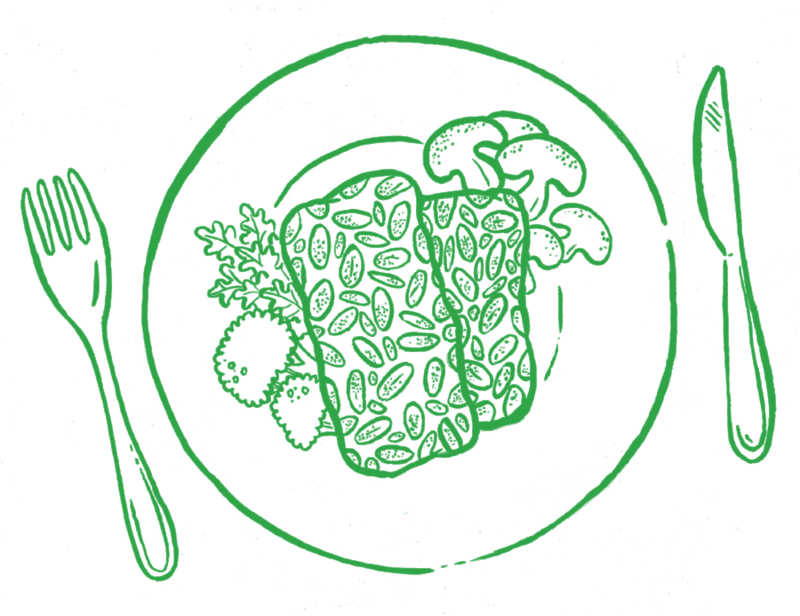 Tempea is vegetarian and vegan by nature and we only use certified organic, non-GMO soybeans. Our current process and facility hasn't gone through the certification process, so we can’t make those claims on our label (just yet). YES our tempeh is gluten-free, with less than 5 ppm of gluten. We produce in a dedicated gluten-free kitchen and routinely send out samples for gluten analysis. As far as our process is concerned, we also do not use any ingredient that has wheat, rye, barley, oats, triticale, spelt or kamut, and these ingredients are absent from our facility. How do I cook tempeh? You can treat tempeh as you would treat tofu since it easily absorbs a lot of flavour. However, tempeh has more bite and texture to it, making it a completely different experience all together. Fry it, grill it, bake it, stew it. Add it to your favourite sandwich, curry, salad, stir-fry, or wrap … Tempea can do it all! Make sure to visit our recipe page for more ways to enjoy tempeh. Can I eat raw tempeh? As with most feremented foods, there may be a risk for bacterial contamination from mishandling. We like to compare it to raw mushrooms: not only is it more delicious eaten cooked, it's much safer to cook off anything harmful that could be in the product. Rest assured, proper controls are constantly in place and we remain committed to only producing tempeh that's safe and beneficial for you. How should I store Tempea? If frozen, the product can last up to 3 months, but there will be changes in texture once thawed, which is why we encourage everybody to enjoy tempeh as soon as they can while it is in its freshest condition. Where else can I find Tempea? Click on our Find Us page! 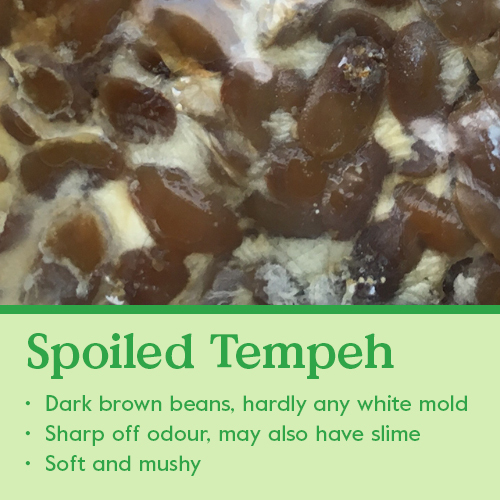 If you would like to arrange a special order of fresh Tempea, you can also place a request on our order page.